On January 18, 2014, Wadah Foundation celebrated its 6th anniversary at JS Luwansa Convention and Hotel. More than 500 guests attended the celebration which included the Ambassadors from India, Singapore, France and the Charge d’affairs of Lebanon. Also in attendance were legislative candidates of Gerindra Party (Great Indonesia Movement) all over Indonesia as well as some friends of Wadah from here and abroad. Apart from the speeches of Pak Hashim and Ibu Anie, testimonies from Wadah International representatives, international partner organizations and local partner communities highlighted the event. Mrs. Babli Kalha of Wadah India and Ms. Christina Ferreros of Wadah Philippines gave their respective testimonies about their activities and experiences with Wadah. Mr. Jose Perez III represented Fr. Rocky Evangelista of Tuloy Foundation in the Philippines, 2011 CNN Hero of the Year Robin Lim of Bumi Sehat and Maiti Nepal Director, Bishwo Ram Khadka shared their greetings to Wadah and expressed their appreciation to Wadah for its support to their organizations. From Indonesia Rev. Widji Santoso and Mrs. Christina “Rista” Da Guer represented the Wadah communities and partner ogranizations in Indonesia. Children from Arjasari community welcomed guests by performing beautiful traditional music "Angklung and gamelan"
Children from Arsari Arjasari welcomed guests through an endearing beautiful Sundanese dance. 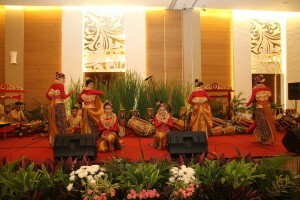 Audience was treated with an astounding Rampak Gendang number performed by the children Wadah community Cibodas Lembang. Closing the program was a choral rendition by the kids from Gita Eklesia Orphanage, a Wadah partner from Ambarawa, Central Java.